Ottawa International Animation Festival 2006: This Weekend!! Hey! It’s just like MY story. Only mine has more technology and less hair. Awwww… you started out so great! I hear ya buddy. Been feelin’ the saaaaaame way. Bad blog!! BAD BAD BLOG!!! Eating Craig’s comment! Sorry Craig. I don’t know what has gotten into it. Hey Craig, I was just telling a guy I work with today, about “The Making of Vesuvius”. What a classic! (Anthony playing the volcano!) Have you put any of your films on line? Ariel: It’s funny how bodies work. When there’s work to be done (finishing a comic book for example), your body goes into work mode, and nothing seems to slow you down. You get tired, but it knows that it can’t stop. As soon as you reach the finish line, it somehow knows, and shuts down. At least that’s what happens to me. I slept for 13 hours a few nights ago. I was useless. One of these days, I’m going to learn that if I just get 8 hours of sleep a night, then I will be more productive during the day, and get more done. Mike: I’m hanging on desperately to my pencil and paper, and my hair. It may be just a matter of time before they are both gone. Fun cartoon. Happens to me all the time. Dice is going to start a Boot Camp Blog. Dig out those walk cycles buddy should be interesting. I can relate, you captured it perfectly. Suzanne: Thanks. I hit a wall with work, and scribbled them out in about 15 minutes. They’re kind of crappy, but it kind of reflects the mood that I was in, so I went with it. We should make comics out of bread, then we could live off of them alot better. (and maybe make some comics out of water, and cheezies and some out of old reruns of the Dukes of Hazzard, and some out of air, and meat). Then we could maybe live off of them. Rob: Let me know when it’s up and running! That’s a fun idea. Troy: I think most of us can. It usually takes a few good night sleeps to bounce back, and then we can start the downward spiral all over again!! Wheee!! great scketches. I think everyone else said it best. 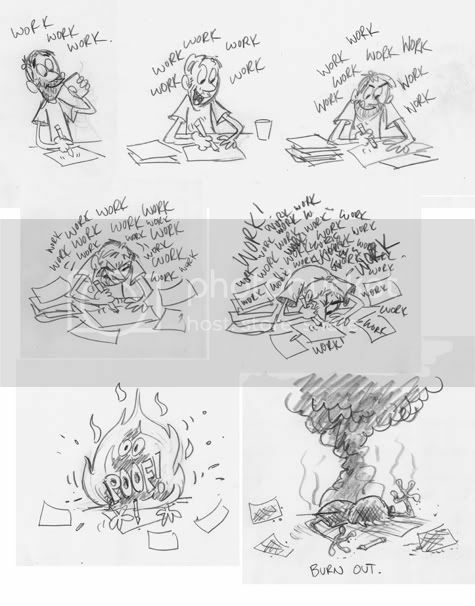 Perfect depiction of the work prossess. Some how it always ends up happening this way. Hope your feeling refreshed by now. Cedric: You snuck in there, without me knowing. Thanks for stopping by and leaving a comment! Drawing is an obsession, and burn out is the result I guess. Mirco: I’m as refreshed as I’ll ever be. (which isn’t saying much). So much to do, so little time. Woah Blair! I knew you had super powers. Human Torch! (panel 6) 😉 I always wondered how you get so much done. Funny strip. That’s so true. In my case, there’s also the baby (and the wife) crying for attention in the background. Love your linework, very expressive. Scott: Get well soon….. there is always more coming down the pipe line. Vi: Super powers, and I make Avery do most of the work for me. Doug: I hear ya. I’ve got 2 kids and a wife. (I wouldn’t have it any other way though). Been there , but the fire was real, I was a smoker at the time. It hurts.